QUESTION: Mr. Armstrong; You said China will become the financial capital of the world after 2032. That means the US must decline. At the same time, you have been consistent in forecasting a bull market in the U.S. share market when everyone else keeps calling for a crash. Are the two connected in some way? ANSWER: Yes, these two events are interlocked. 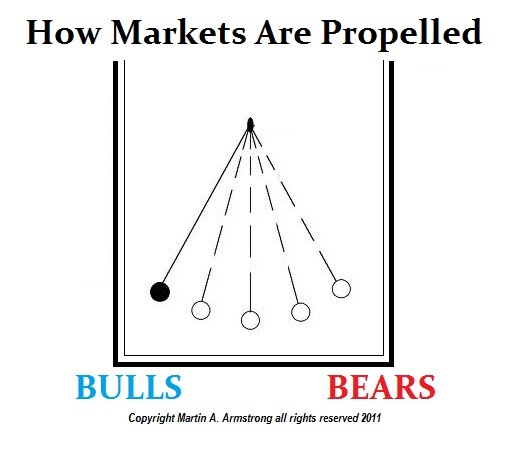 All markets function very distinctly. They move like a pendulum. The famous one in the United Nations building with the classic physics experiment, Foucault’s pendulum, is propelled by the rotation of the earth itself. While it had long been known that the Earth rotates, the introduction of the Foucault pendulum back in 1851 was the first visual proof of the rotation of the Earth in an extraordinary easy-to-see experiment. The pendulum remains in a constant oscillation relative to the universe. As the earth rotates, we can see that it does so around the constant path of the pendulum swing. This applies to market behavior as well. There is a constant oscillation to everything we call our Benchmarks. They remain constant within the universe and everything else rotates around them. The energy that maintains the cycle is the constant oscillation between two extremes. The further it swings in one direction, the greater the energy moves in the opposite direction. This is the very essence of how everything moves. This is the creation of energy to keep things going from the instant of creation also known as big bang. Personally, I do not believe in just a simple big bang. I believe after big bang; the expansion will stop and then reverse and move back toward the point of origin. Then it will explode outward once again. I do not believe it was a one-time event since energy can neither be created nor destroyed – only transformed between states. Now apply this to markets. The real energy within a market is always to trap the majority, for then they lose money and it forces them to cover their position. If 90% of the people are long, then any news can set off the collapse. If you scare the majority, there will be no bid when you try to sell, which results in a flash crash. Likewise, this current rally in the Dow from 2009 has been the most bearish in history. The majority of analysts still keep calling for an inevitable crash. Retail participation still remains near historic lows. You cannot get a crash of major consequence as long as the bulk of the people are not invested in the market. Here you see how the market ALWAYS makes a false move just before it makes the real move in the direction of the underlying trend. At each correction, the emotions run high and people ALWAYS expect whatever trend is in motion will remain in motion. Hence, shorts build up and then they are compelled to cover and that gets the rally moving. Markets are fractal. So whatever you see on only level of time, must exist on all levels of time or else it is not real. 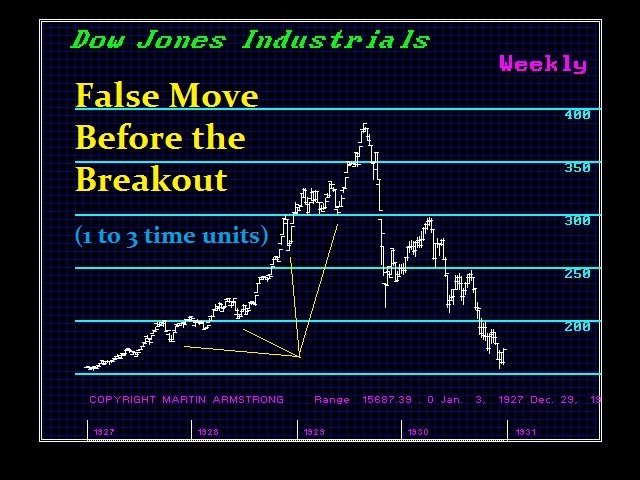 The Dow made a Yearly FALSE MOVE on a number of occasions. For example, the high of 1916 dropped from 8500 to 6590 and established the low in 1917. It then swung to the upside, reached new highs at 11960 in 1919, and then on the panic back down. 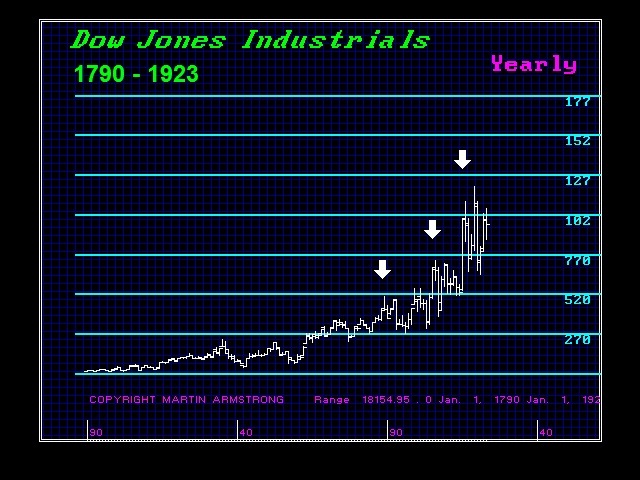 The Dow made its intraday high in 1889, which was followed by a one year panic into 1890. It then swung back to the highest yearly closing in 1892 with the famous Panic of 1893 immediately thereafter. A similar pattern unfolded with a high in 1872, a panic penetrating the previous year’s low in 1873, and then a dramatic swing to new high the next year in 1874. The goldbugs simply hate me even saying that gold can still move below $1,000. They approach everything only in a linear concept – it must only move up and never down. This is how they lose money consistently. The extreme ones are married to this idea that gold will rise in an apocalyptic fashion when everything else turns to dust. There is always a FALSE move before the true direction. 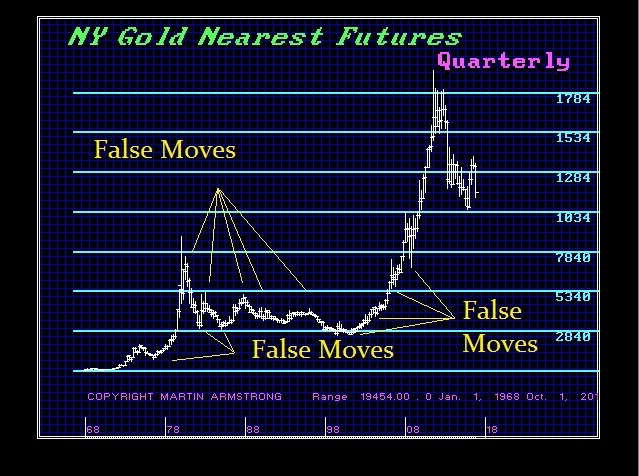 A move for gold below $1,000 will create the energy needed to send it soaring past the $2300 level which is the 1980 high adjusted for inflation. This is what our Reversal System is all about. It is to define that point of no return where we can differentiate between a false move and a real breakout. Now, because everything is fractal, and we have been able to identify the existence of constant Benchmarks in everything, it becomes possible to observe the rotation of capital around the world which is behind the rise and fall of every civilization since the dawn of the human race. 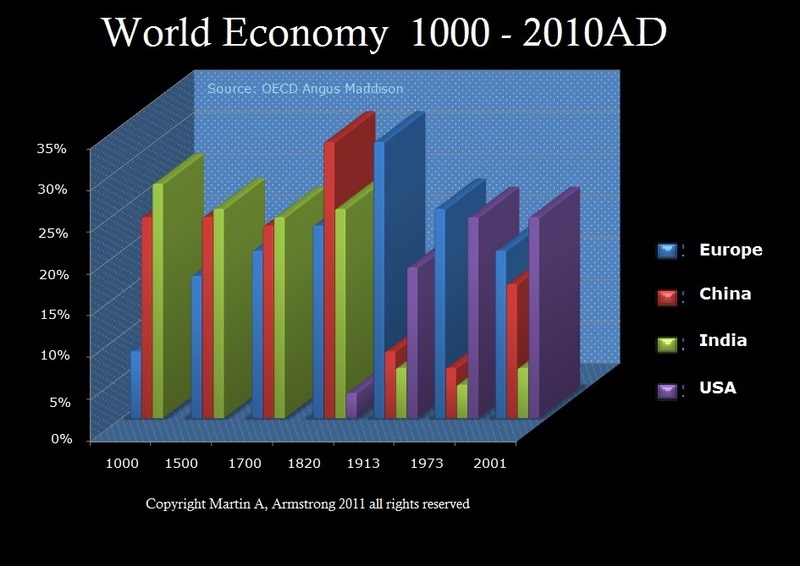 In 1990, China was just 5% of world GDP. Now in 2015 it has risen to 15%. The United States is the world’s largest national economy in nominal terms representing 24.5% of nominal global GDP. We first must send the share markets up dramatically. This will be the FALSE MOVE that makes everyone see that the USA is the only game in town. That will be the extreme point, reaching the maximum swing and then its own weight will cause it to move back in the opposite direction. Just as the British Empire rapidly collapsed following World War I handing that title of Financial Capital of the World to the USA, we will see the same take place as that title moves to China. One of the critical factors that will kill the US economy will be taxes and overregulation – both the socialist’s dreams come true. What broke the back of China and Russia in 1989, was this same failure of Marxist philosophies that call for total central planning by government. It is merely the West’s turn to now collapse because of the same philosophy of Karl Marx. Only a fool believes in the fairy-tales of happily ever after. There is a cycle to everything. The Pension Crisis Report went into detail. Men mature slower than women, so historically the man was always much older than his wife. Hollywood sold lust as love at first sight and as the age difference collapsed, divorce reached cyclical highs. As they say, a girl becomes a woman at 23 but a boy does not become a man until 40. Women married boys but expected them to be men. Today, much of the youth reject marriage and having children. The demographics and changing life styles are undermining the entire idea of pension systems. This is a crash that will also propel the shift. Interestingly enough, in the former communist regions, people never trusted government so they expected nothing in return by tyranny. In the West, society still believes in government and the dream that they will be there. When government falls, Western society will not be as self-sufficient as they were in China. Socialism replaced the family structure in the West so children did not save to take care of their parents – that was government’s job. We face a lot of real social problems moving into 2032. That’s what our WEC conferences are all about.